Oh my, this has to be the most difficult and dangerous act Creme's ever done. She somehow jumped from the washing machine to the top of the door which situates in the opposite side of the wall. This requires both spectacular long jump and high jump skills. I didn't see how she got up there, when I saw her, she was already in the following state. I tried to give my hand to Creme but she didn't want my help. Cookie's presence didn't help but made her more anxious. 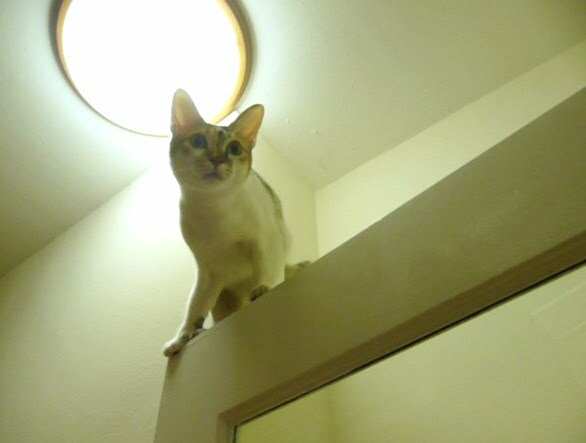 Apparently, Vincent has already witnessed this acrobatic act of hers several times, for him to comment that "she's always jumps up and down from that door". Eventually, Creme saved herself by pacing her paw down and leaped down like a lightning.